Modern farming practises with increased stock per m², is a complex, dynamic and challenging business. The resulting slurry provides its own challenges, along with the fermentation residues from biogas plants resulting from the extraction of gas and electricity from biomass during anaerobic digestion. The Clearfox Nitro system can remove nitrogen from liquid slurry. This means that the treated slurry can still be spread on land within Nitrogen vulnerable zones – removing the requirement to transport the slurry away from the farm. These residues are highly polluted and are characterized by a high proportion of nitrogen compounds, which cannot be discharged without accumulation in groundwater/surface waters. This is why we have developed a process that is easily maintained and robust, with which these effluents can be treated. The future demand for treatment options for this type of wastewater will increase, as the Nitrates Directive (91/676 / EEC) and the reorganization of the Fertilizer Ordinance of 31 March 2017 which extends the storage time of wastewater containing effluents and limits applications, calls for action. This customized purification technology treats wastewater with a high nitrogen content in relation to carbonaceous compounds. The focus is on a simple, solution-based technology with low operating costs in the long-term. The system is flexible and applications can be tailor made to fit the needs of the client. The individual cleaning modules of the system have been in use for many years globally and in a wide variety of industrial applications. 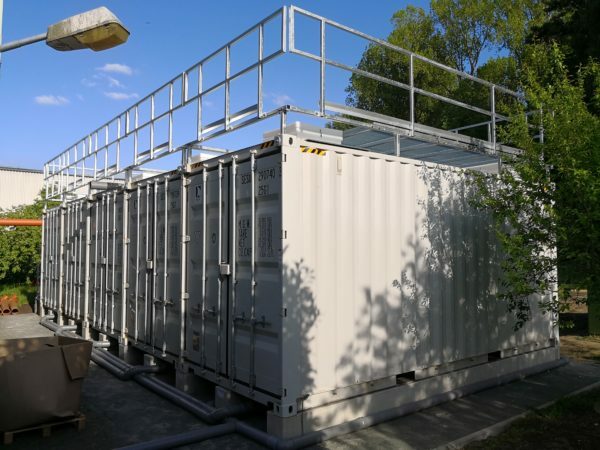 ClearFox® container modules consist of different technical components to achieve a physical, chemical and biological treatment during the liquid phase. All components are factory-installed in modular containers under factory conditions and tested in our factory in Germany, according to relevant industry standards. This is cost saving, reducing construction site services to a minimum, as far less time is spent on-site during installation and commissioning, due to the “Plug &Play” modular system. The entire system runs fully automatically, and tests conducted by our in-house laboratory, allow us to optimized the entire system for the respective wastewater composition. The typical sum parameters (BOD5, COD, N, P, oTS) can be reduced to such an extent that the treated wastewater can be discharged directly into receiving waters or a public sewer network. The residues produced during the cleaning process (thick and thin sludge) can be dehydrated, post-fermented and / or recycled directly as fertilizer. 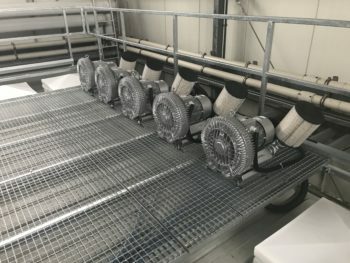 This system can be adapted to changing conditions and thanks to the modular design, the system can be expanded and optimized for further cleaning goals. The ClearFox® container plant has been tested and certified by independent sewage testing institutes. The biologically effective modules, have in addition to the high performance, proven a robust, simple and low maintenance operation. The existing tank infrastructure in which the slurry from the production is stored is provided by the customer and may be adapted and individually partitioned to form two slurry holding partitions or tanks. The one tank partition remains for the holding of raw slurry from the production line, which is preferably pumped at a location or water level, at which effective settling has taken place. The second holding partition or tanks is needed to store the fine slurry after separation (Step1) has taken place. In contrast to the first holding tank, the contents of the second holding tank are continually mixed by means of agitators. These partitions or tanks have a direct influence on the overall cleaning level of the system. Slurry Treatment Step 2: The supernatant water from this fine slurry partition, still containing fine suspended material, is pumped to the thickener and is then treated. In the thickener, precipitation and flocculants are added to intensify the thickening process. These substances help to form mud flakes that are easier to separate. The resulting sludge is sent to the separator where it is further treated. These solids can be used as fertilizer or for fermentation. Slurry Treatment Step 3: After separation and thickening, a pressure-release flotation (DAF: Dissolved Air Flotation) follows. In a polymer preparation station, auxiliaries are generated which promote the precipitation / flocculation and flotation process. These are added fully automatically to the incoming wastewater by means of dosing pumps. A multi-phase pump, ensures that the flow of water is constantly saturated with air and then returned via a recirculation process in the reactor. The addition of precipitants / flocculants, cause particles dispersed in the liquid phase (solid particles, droplets, molecules, ions) to combine and form larger flocs. The pressure release creates micro air bubbles, which rise from below and carry the formed sludge flakes (flotate) upwards, where they accumulate in the upper part of the reactor and are separated by a scraper or discharged through a cone-shaped opening, with the compressed air (airlift principle). The floating flotation sludge is separated and sent to the mud reservoir. The flotation and chemical treatment is usually two or three stages. In the first stage, part of the nitrogen and the phosphorus present are chemically bound and separated with the fines. This type of sludge is usually recycled as fertilizer using suitable polymers. The cleaned water is withdrawn in the middle and flows to the fixed bed reactor container. 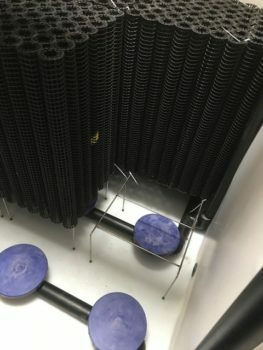 Slurry Treatment Step 4: The process in the Fixed Bed Reactor is hydraulically balanced, permanently submerged and ventilated, to ensure that cleaning-effective microorganisms settle and form a biofilm on the surface area provided. The cascaded fixed bed system is especially designed to ensure an optimized flow path of the waste water to successive areas with different specific fixed bed surfaces. This results in an efficient adaptation of the microorganisms to the wastewater load and a balanced cleaning performance in terms of biological oxygen demand (BOD5) and chemical oxygen demand (COD), almost independent of load fluctuations. 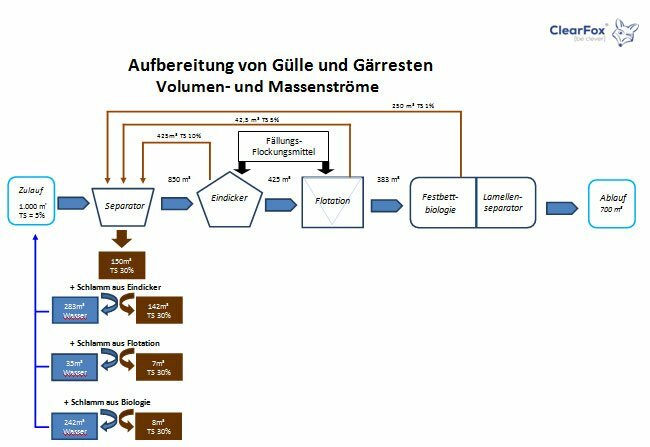 This process is needed to accelerate the conversion of ammonium and organic nitrogen in subsequent biostages. Slurry Treatment Step 5: The remaining waste water passes through a slat slope clarifier container, to separate the secondary sludge formed in fixed-bed biology. This sludge is again pumped into the sludge storage tank. Slurry Treatment Step 6: In an additional Fixed Bed Reactor module similar to step 5, the nitrogen is degraded using bacteria under ideally designed environmental conditions. The nitrogen, which is much more concentrated than domestic wastewater, is broken down using specially developed solid bed materials (nitrification and ammonification). This customized surface and the aeration maximizes the rate of degradation of the bacteria that convert the nitrogen. Conversion rates of more than 1 kg of ammonium nitrogen (NH4-N) per m3 reactor volume can be achieved. Once again the waste water flows is optimized to ensure that the microorganisms, attached to the cascaded fixed bed surfaces, are able to efficiently adapt to the wastewater load and a balanced cleaning performance to nitrate is reached almost independent of load fluctuations. Slurry Treatment Step 7: The waste water with nitrate formed in the Fixed Bed Reactor(N) is now pumped back to the second holding partition or tank with the agitator (denitrification tank). In this fine crude slurry tank, the carbon compounds in the slurry favour the denitrification process allowing the returned nitrate rich wastewater to be naturally denitrified and converted to elemental nitrogen N2 under anoxic conditions (no oxygen supply) and simultaneously pre-cleaning the raw waste water. Elemental nitrogen N2 is completely safe and climate-neutral, since the atmosphere already naturally consists to 78% of nitrogen gas. The process is therefore a completely natural reaction, which has been optimized and accelerated by using technically created environmental conditions. In the N Fixed Bed Reactors, relatively little sludge accumulates, in contrast to the C Fixed Bed Reactors and can be ignored. The mechanically and fully biological cleaned wastewater can be directed into the nearest receiving water system, sewer or may be used for irrigation. The solids and sludge from the sludge storage may be used as fertilizer. Alternatively, they may be composted or dried and marketed. The modular design allows for free combinability or supplementation of the individual units as required. All plant components are mobile and can also be leased. a) the supernatant waters (blue) are returned to the feed and must be added to the liquid phase at the end. Thus, a volume distribution of 85-90% water and 10-15% sludge will eventually result, depending on the degree of dewatering or further utilization of the resulting solids and on-site opportunities. b) the air phase in proportions by weight of N or C, which is climate-friendly and odor-free as N2 (normal breathing air consists of 78% thereof) is expelled. c) a part of the storage tank can be used before the inlet as an effective reaction volume. This is where sludge thickening, thickening, denitrification and C degradation (loss of CO2 in gas phase) take place. We are happy to compose an individual offer for you. Let’s discuss your requirements together. Are you interested?